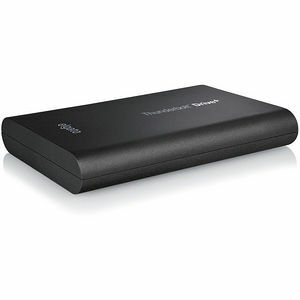 Elgato Thunderbolt Drive+ unites the most advanced storage technology in a revolutionary high-speed soluti-on. Set in a dust and water protected metal enclosure, it's the perfect storage solution when you're on the go. Using server-grade Plextor SSD technology, it dra-matically outperforms other portable drives, without compromising on portability. Its bus-powered operation ensures that your data is always there with you, even when you're not near a power source. Elgato Thunderbolt Drive+ features both the most advanced and the most common connectivity standards to make sure you can always access your files. With Thunderbolt™ technology, you're all set for the future of high performance interfaces. Meanwhile, the backward compatible USB 3.0 port ensures that you can connect Elgato Thunderbolt Drive+ to virtually any computer that you need.